Mountain snowpack and associated snow water equivalents (SWEs) across most of Wyoming were generally above average by the middle of March. 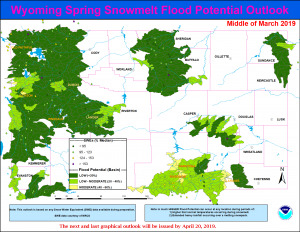 SWEs at the peak snowmelt runoff elevations (8,500’ – 10,000’) were the highest across the Little Snake, Upper North Platte, and Laramie Basins at 120 to 130 percent of median. The Tongue Watershed had SWEs at 80 to near 90 percent of median at the peak snowmelt runoff elevations. This outlook is based on various diverse hydrological factors such as snow water equivalents (SWEs) in the mountain snowpack, basin morphology (i.e. 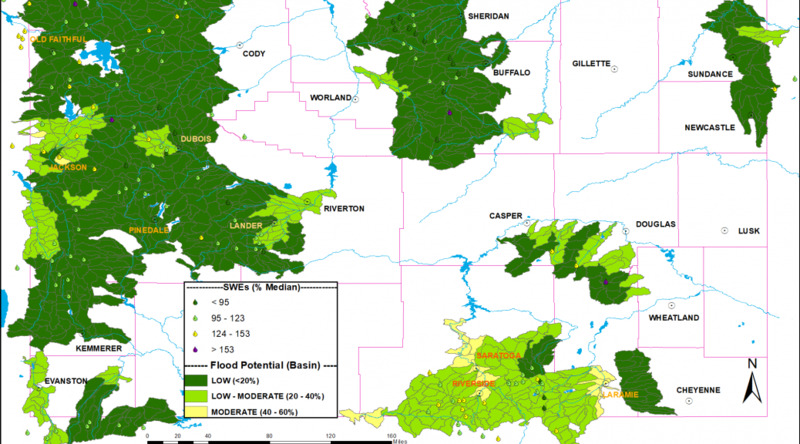 how basins respond to snowmelt runoff), antecedent soil moisture, biological/physical factors (bark beetle kill/spruce blight///fire burn scars), low elevation snow depths, and likely temperature and precipitation trends during late spring/early summer.